Follow the step by step directions and learn two unique quilting techniques while completing this distinctive quilt project. 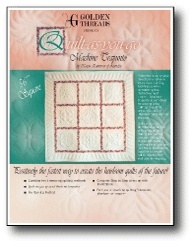 Machine trapunto is a method for adding extra batting to quilted areas without the intensive hand work of the past. Using the zigzag stitch and binding strips you can join the quilted blocks together to create quilts ranging from wall size to king size. Includes complete step-by-step directions with illustrations, and instructions for using the No-Marking Method. 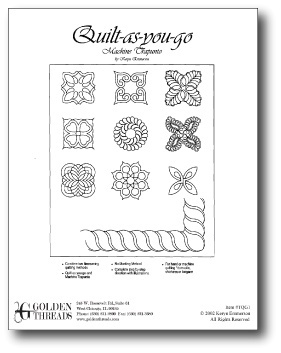 For hand or machine quilting using domestic, shortarm or longarm methods.